THE BEST MEN'S WATCHES UNDER $200 | muted. Our buying guide, The Best Men’s Watches Under $200, looks to up your watch game by offering you watch options that have some specs that you may have missed in our buying guide that featured men’s watches under $100. In this guide, you’ll start to see watches that include updated styling, Swiss movements, better water resistance, and higher quality bands. Some details to keep in mind. For the most part, if a watch does not have a water resistance 100 meters or more, I would look to avoid water altogether. If it’s rated at 100 meters, it should be OK in the shower, or for a quick dip in the pool. If it comes with a leather band, though, I wouldn’t risk it. Leather and water just don’t go together. Inspired by the great outdoors, as their slogan says, Redwood’s Tactical Watches ($140) includes this amazing watch that uses simple yet bold design choices to form an amazing timepiece. Available in a range of colors to please any man Redwood Tactical Watches are sure to be a popular choice among watch lovers. While it’s designed for the outdoors this stunning watch will look just as good indoors and comes with a great set of features including: a full stainless steel body construction, 120-click unidirectional bezel, a thick 40mm case, high-quality Japanese quartz movement, re-enforced hardened mineral glass and it’s also water resistance up to 100 meters. Best Automatic Watch Under $200. If you’re looking for an affordable automatic watch you can’t go wrong with the Seiko Men’s SNZF17J1 5 Sports Automatic Stainless Steel Watch ($184). Seiko makes some of the highest quality affordable watches on the planet and the SNZF17J1 is no different. It features a fully stainless steel case along with a 22mm stainless steel band. The case is topped with a Hardlex mineral crystal and the dial features a day and date window. It is also water resistant down to 100 meters. This is one of my favorite daily wear watches. Famed watch maker Timex and the boot maker Red Wing proved to be a match made in heaven with this stunning watch from their latest collection. The Timex x Red Wing Heritage ($109) features a bold and elegant design this heritage watch is a limited addition piece that anyone will love and it’s all available for less than $20. Its impressive features include a 40mm stainless steel casing, Red Wing leather strap, full Arabic dial, and 50-meter water resistance capability. This stylish watch will make a great gift and is easily suitable for both professional and casual wear. One of the most popular names in watch making is back! Daniel Wellington is a brand you can trust or if you’ll excuse the pun set your watch by! The stunning Daniel Wellington Men’s Sheffield Watch ($78) is the ideal watch for today’s modern, fashionable man and is the perfect hybrid of style and smart, practical design. Among its features are a rose gold minimalist design, 36mm case with mineral dial window, quartz movement with an added analog display and water resistant capabilities up to 30 meters. The thick leather calfskin band even features tonal stitching and a strong thick buckle closure. Men of any age will be sure to love this stylish watch and it would make a great gift for any occasion. The Best Men’s Sports Watch Under $200. If you need a sports watch under $200, then look no further than the Casio Men’s G9300-1 Mudman Sports Watch ($125). This watch has everything you need to get you through your workout. First off, with its 200-meter water resistance, it can handle any water you can throw at it. And because it’s a G-Shock you can take it on your most brutal treks without worry. Additional features include a resin shock resistant case, a full day, date, month calendar, and an array of timers that include chronograph, dual-Time-display, stopwatch, and world time. But that’s not all, this bad boy is also solar powered which means you never have to worry about winding or a dead battery. Just make sure you get some sun occasionally and you’ve got a charge for up to 8 months. 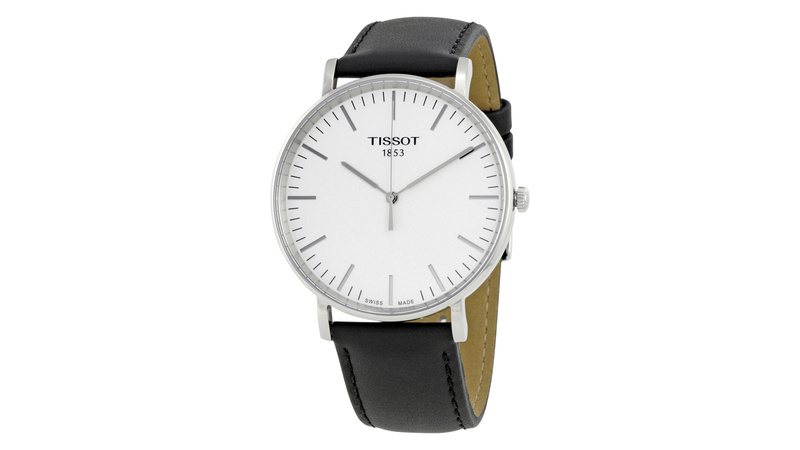 The crowning jewel in TISSOT’s T-Classic Every time series, the Tissot Everytime Silver Dial Leather Men’s Watch ($126) is a stylish men’s watch that’ll make a great gift for any occasion. And with a huge range of impressive specs and features, you’ll have trouble believing that it really is available for under $200. It’s available in a range of colors and features a thick stainless steel round case, an analog quartz movement, and a scratch-resistant sapphire crystal. This simple yet stylish Swiss made watch is perfect for today’s modern man. Plus its also water resistant up to 30 meters and features a silver dial with silver-tone hands that create a striking luxurious watch face.